What's that I hear you say? Lemon butter isn't baking? Well, no technically it is not. However, lemon butter can be a wonderful part of many baked things. It actually has many many uses including a topping for ice cream, a filling for cupcakes, a topping for a pavolova, a spread for pancakes...this list goes on and on. I don't know about you but I have often struggled with what the correct name of this delicious stuff is. Is it lemon butter or lemon curd? Well, after doing a bit of research today, I have discovered that they are actually two distinct things and each has a different purpose. Lemon curd is made with either cream or milk or both. However, lemon butter is simply made with lemons, sugar butter and eggs. 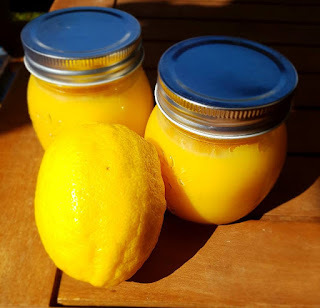 Lemon curd is usually served as a dessert (a recipe for which appears in the recipe section of the CC website) whilst, as I have previously mentioned, lemon butter has many uses. Anyway, this is definitely a recipe for lemon butter and it is delicious. There is optional lemon zest that can be included which will give an extra tang to the butter. But, if like me, you prefer your lemon butter to have a smooth texture, don't add the zest. This recipe makes two cups of lemon butter. 02 September 2016 - I have revised the originally recipe. I have changed the cooking time and decreased the butter. This gives a thicker lemon butter. 3/4 cup fresh lemon juice ( I used 4 1/2 lemons - I microwaved them for 40 seconds to get maxmimum juice). 1. Place butter, sugar and eggs into the bowl with the whisk. Stopper out. 2. Select Speed 6 Time 30 seconds. 3. Pour lemon juice into bowl. 4. Select Dessert P1 Speed 3 Temp 90 Time 11 minutes. 5. Lemon butter is ready when it is the consistency of runny honey. 6. Pour into the containers you will be storing it in. 7. Allow to cool and then store in the fridge. 8. Lemon butter will thicken further once cooled. Hello, Linda. Thank you for your generosity in sharing your recipes. I have a question about this recipe - what size eggs do you use? I usually buy large eggs (63-73 grams). If you're using medium, for example - 53-63 grams here in Europe - I could potentially add 40-80 extra grams of egg by using large, which could seriously unbalance the end result. Thank you for your help, Craig.